DUMBARTON lost Mark Docherty and Frazer Wright through injury, and then two goals as Greenock Morton took the points with a 2-0 win. DUMBARTON lost Mark Docherty and Frazer Wright through injury, and then two goals as Greenock Morton took the points with a 2-0 win at the Cheaper Insurance Direct Stadium. A crowd of 1,145 watched a rather dull match on as very dark afternoon. A floodlight failure at the start of the second period caused a short delay and the early minutes of the half were played in very poor light until the electrical fault was repaired. The first half was fairly even. 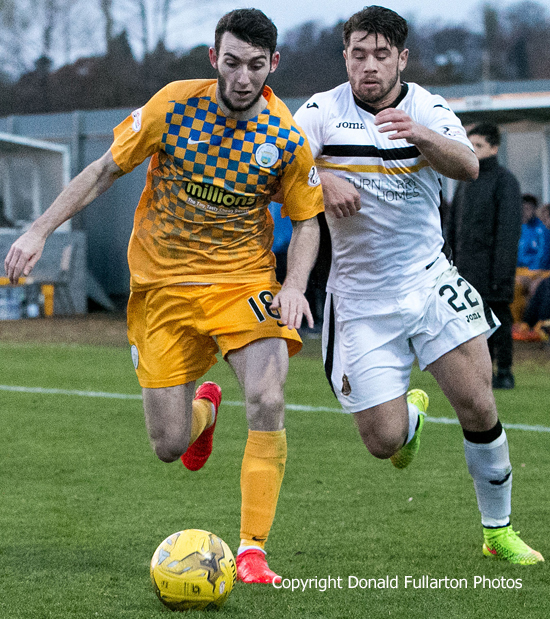 Morton were sharp but lacked bite up front, while Sons looked to create chances on the counter. The best opportunities ifell to Sam Stanton for the home side and Andy Murdoch for the visitors. A temporary floodlight problem delayed the start of the second period by a few minutes. On 53 minutes Sons defender Mark Docherty was stretchered off after a nasty injury. He received generous applause from both sets of fans. Losing Docherty and then Wright to a knock was a big blow for Dumbarton in the centre of the park and in defence. So it was no real surprise in the 61st minute when Mark Russell broke the deadlock, firing a quality, swerving strike past Sons keeper Alan Martin to put 'Ton one up. The goal sparked Morton into life, and a series of dangerous attacks followed. Then minutes later Kudus Oyenuga scrambled the ball home to make it 2-0. From that point on it never really looked as if Dumbarton were going to get back into the game, and in the end the Greenock side were comfortable winners. The picture shows Andy Stirling challenging Jamie McDonagh.